Once again this year, Joe Salama (with co-host Polina Sayess, M.D.) has put together a great collection of video interviews as a benefit for the Farm-to-Consumer Legal Defense Fund. 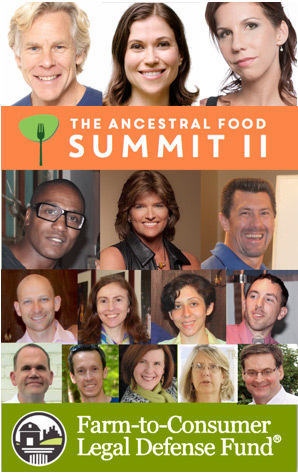 The 11 hours of video were recorded at the Ancestral Health Symposium last summer. You may recognize Mark Sisson, Sarah Ballantyne, Kendall Kendrick, Darryl Edwards, Nora Gedgaudas, Keith Norris, Rick Henriksen, Cate Shanahan, Stephanie Welch, Chris Masterjohn, Jimmy Moore, Josh Turknett, Kaayla Daniel, Lynda Frassetto, and myself. Videos are free for selected times during the summit. My video and Lynda Frassetto’s will be free on Friday June 5 from 5 pm to 9 pm Eastern time. If you miss talks, consider purchasing the whole collection. The Farm-to-Consumer Legal Defense Fund helps maintain the freedom of small farmers to grow and sell healthful food, so your money will help support a worthy cause. so is 1 1/2 Tbs. of raw PS still ok? What about cooked PS is that ok? and lately i see you are more for vinegar, so how much for adult, chidren, and kids? Hi Paul, I tried to log in but failed. You might want to let the organizers know it isn’t working.